I haven't participated in a Wine Blogging Wednesday for a while, but I just had to join in with Sam's theme of Champagne! 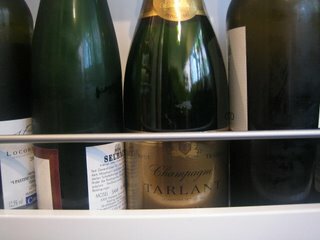 Especially since I had the terrible task of having to choose a bottle of champagne for G's birthday! 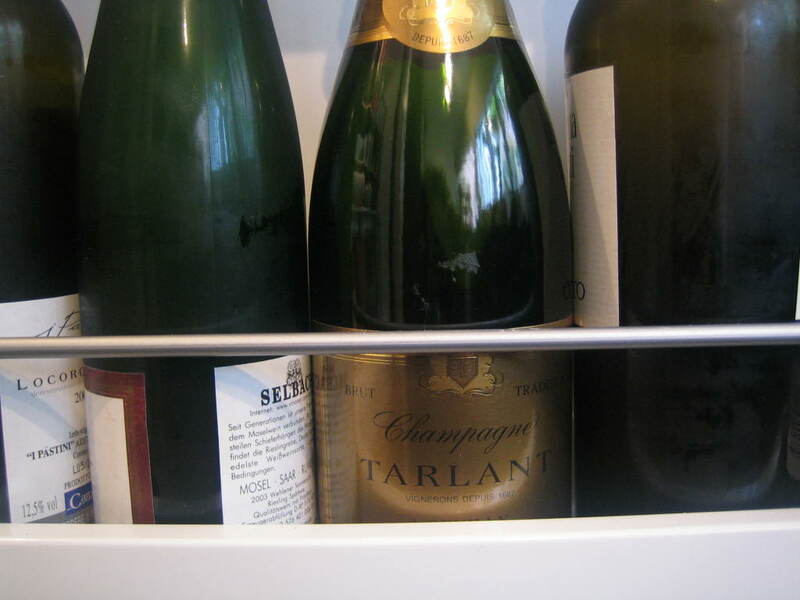 "If you want boring old Veuve or pricey Bolly that's cool, however if you haven't tried our Tarlant wines then I recommend you give them a go." Well, if he is going to put it like that, how could I refuse! We decided to try the Tarlant tradition, which was described as Dry, yeasty, Bollinger. We opened the bottle as planned for G's birthday accompanied by some roasted nuts and olives. Not sure if it was the best food combination but we rather enjoyed it! To describe the wine : It was dry and yeasty, and if my memory was better I could probably agree it was like Bollinger. It had a lovely clean fizz and a good flavour, slightly fruity, but not overly so. It was golden and had a good quantity of bubbles. We were very impressed with our departure from the norm, and I think this will be featuring in our fridge again. We were also able to try the Prestige '97 vintage at a wine tasting a week or so later, but too be honest, and I probably shouldn't admit this, but we rather prefered the Tradition which is the cheaper sibling. Oh well, I suppose that means we can have it more often! thanks for taking part in WBW. I dont think you should be worried about admitting you prefer the cheaper wine. I always find the non vintage ones to be crisper and sometimes I prefer that. The vintage champagnes are far more complex and rich and, well, you have to be in just the right mood for that. I am working on the round up (these things take a while) but I am aiming to have it up before the weekend is out. thanks, again, for joining us. Hi Emma. Being very very new to all the blogging event thing, I don't quite grasp what is involved in DMBLGIT yet. I have a blog. Tick. It's about food. Tick. It's got pics. Ticks. So what do I need to do now? Please please please help me. Thx! Hi Asmeo, Check back here around the 7th October for details about the October round of DMBLGIT. And in the mean time check toastpoint for details of the September round!